"Yesterday a wizard entered New York with a case. A case full of magical creatures…" Warners Bros has unveiled the very first "announcement" teaser trailer for Fantastic Beasts and Where to Find Them, the spin-off continuation of the Harry Potter franchise. This is a very short initial trailer without much real footage, but it does remind us all that this is connected to the Harry Potter universe. 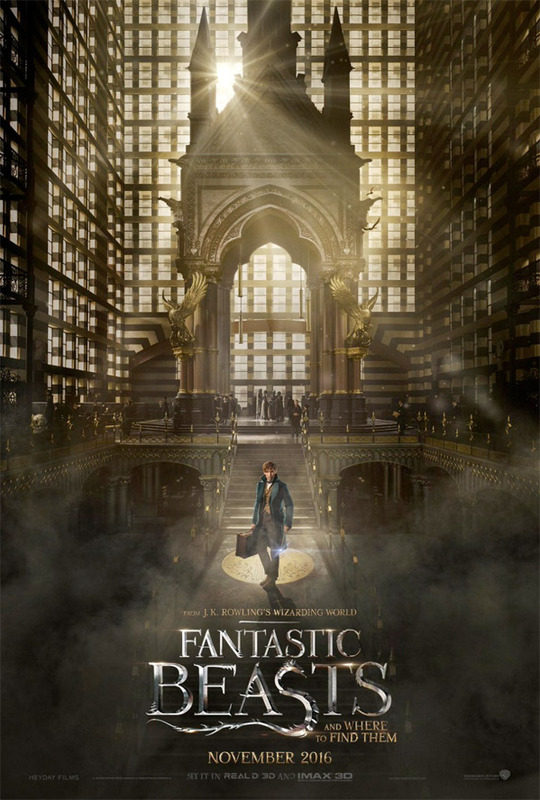 Eddie Redmayne stars as Newt Scamander, a writer living in New York City. The cast includes Ezra Miller, Colin Farrell, Ron Perlman, Jon Voight and Samantha Morton. This is the same David Yates who also made The Legend of Tarzan, and is currently in the middle of filming this. It's just our first taste. What do you think? The adventures of writer Newt Scamander (Eddie Redmayne) in New York's secret community of witches and wizards seventy years before Harry Potter reads his book in school. A new spin-off series from the Harry Potter world, written by J.K. Rowling. The first movie, Fantastic Beasts and Where to Find Them, is being directed by English filmmaker David Yates, director of Harry Potter and the Order of the Phoenix, plus Half-Blood Prince, and both Deathly Hallows two-part finale. The film features the American version of the Ministry of Magic, housed in the Woolworth Building in New York City, known as the "Magical Congress of the United States of America (or MACUSA)". Warner Bros is currently filming Fantastic Beasts and Where to Find Them with Yates at the helm, and an opening set for November 18th, 2016 next year. This looks pretty cool... for something out of the Harry Potter universe... Seeing that Ron Perlman is in it... I expect Hellboy to show up and whip some 'fantastic beast' buttocks! Good teaser. I love the NYC setting and time period. It's going to be fun to see the American wizarding world and tying the enemies of the main characters to Salem is great. My one fear is that JK Rowling wrote the script herself - I love her writing - but this is her first "solo" screenplay I'm told. Hopefully that doesn't show in the film. I do not want to sound too nostalgic here, but I am quite excited by the prospect of returning to JK Rowling's world of wizards and wizardry. I know many will cry a fowl at the "milking" of this beloved franchise, but it just feels good to see this world grow new branches. I have voiced many qualms here on FS with the actor Eddie Redmayne, but in the brief seconds we spent with him in the teaser, I have to say I am optimistic. Oh man I can't wait. This could be a big hit, but personally i don't like the Harry Potter movies. Hopefully there are going to be actual beasts in the movie, or at least Marshawn Lynch! Doesn't look like the style is very different from the previous Potter movies but at least this series will bypass all the painful child acting from the early Potter chapters.